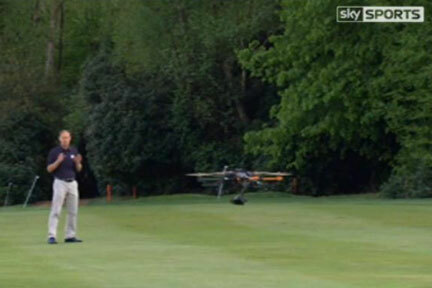 Securing exclusive rights to live coverage of the BMW PGA Championship at Wentworth was obviously another coup for Sky Sports and their relentless cornering of the market. But with so many hours of live coverage come the inevitable ‘fillers’ between play. Maybe I’m just an old cynic, but the latest addition to Sky’s technological armoury didn’t really elevate the viewing experience, even if, ironically, ‘elevating’ it was precisely what it did do. 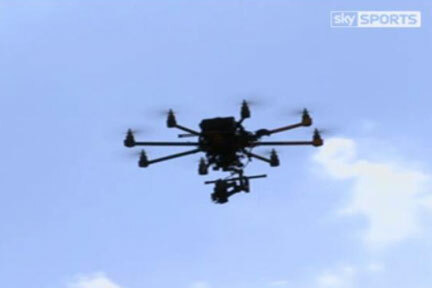 Best described as a ‘Heli-Cam’, this was a small camera mounted on a radio controlled device with propellers that could fly up and down the fairways to Mark Roe’s commentary. The idea was to heighten insight (excuse the pun), but in reality it just gave us an alternative view of Mark’s hairline. Personally, I find it slightly odd that this is the best Sky can come up with, especially when half of the feature seemed to be from another camera, filming the flying camera! And why the obsession with spending on more techy developments, when surely the golf is enough entertainment in itself? Anyway, my prejudices aside, all this did get me wondering where Sky will be placing their cameras next, and I’ve shared a few tongue-in-cheek suggestions below. At last, slow play goes to court! The new ‘Clock Cam’ countdown feature sits proudly in the corner of our screens, resetting at 40 seconds as a player begins their pre-shot routine. The perfect aid to armchair referees, within hours the Tour’s helpline would be flooded with allegations of infringements. Penalties and disqualifications would reduce the field to half a dozen in no time (Tiger, of course, enjoys his undiplomatic immunity). Ever wondered what sandwich filling Luke Donald favours? What does a caddy say when their player has just struck the perfect shot only to see their ball fall twenty yards short of the green? And just what special notes are in those yardage books? All is revealed by ‘Caddy Cam’, a micro camera worn by all caddies, akin to the helmet cameras in Formula 1 racing. Just imagine seeing those glares from fuming players close up! Who sits about playing cards? Whose superstitions would have us all in stitches? And who hasn’t got a nice word to say about Sergio? This is the ultimate in behind-the-scenes viewing – the ‘warts and all’ of professional golf. But then again, we’ve already seen Henrik Stenson strip down to his pants and that was more than enough for one lifetime, so perhaps we’re best forgetting that one. I actually think there is some merit in this one. Sky’s ‘red button’ allows alternatives to the main broadcast in other sports, and I genuinely think that watching how the leaders go through their warm up routine would actually be very interesting and we could learn a lot. How quickly do they go through the bag? Who gets their head down and beat balls and who relaxes by chatting to people? A couple of elevated cameras behind the players would be fairly simple and cheap, and it would genuinely add to the viewer experience. Well, it’s better than Heli-Cam anyway. If you can think of other novelty camera positions and want to share your ideas, please feel to do so…..